My baby just turned one! I can honestly say that I’ve loved every minute of the past 12 months. I never thought I would have this experience again – both being pregnant and having a new baby – and I’ve savored all of it. But I’ve also been feeling incredibly emotional about my kids and motherhood over the past few months and I know from experience that writing about it the best way for me to process and make sense of it all. In particular, I’m feeling uncertain about being done having kids and I’m trying to make sense of that. We’ve never really had a choice – we’ve either prayed for a miracle, used infertility treatments or pursued adoptions. But at this point, with this recent surprise pregnancy, I’ve wondered if we might have a choice NOW. I’m sure I want to be done and not so sure all at the same time. Mostly, I’m sad that this is the point where I finally might have a choice. If you don’t know my history, I have two biological children and two adopted children. JC was a surprise pregnancy 14 years ago. We were preparing for infertility treatments when I found out I was pregnant. He was a gift from heaven and the reason I was able to remain hopeful that more kids would come. We had 5 failed infertility treatments after him at which point we decided to pursue adoption. That was a big decision and came with grieving the hope of ever being pregnant again. To be honest, at the time, it felt like I was giving up. Now I know that adoption was the gift that infertility gave me. We brought Ben home from the hospital when he was just 2 days old, right after witnessing the most loving and selfless act in the whole world: birth parents placing their baby in your arms and walking out of the hospital empty handed. It changed me forever. A few years later, we felt inspired to pursue a second adoption. We explored a lot of options about what agency to use or where to adopt from, but always kept coming back to adopting a little girl from Korea. We found a great agency that allowed us to select gender (which apparently isn’t common). We were told that it would be a minimum of 3-4 years before we were able to bring a child home, but we were matched sooner than expected and brought YeonAh home 2 1/2 years later. An international adoption is a whole new ball game and a complete emotional rollercoaster. But we had prepared ourselves well; we all learned a bit of Korean, we worked with an attachment specialist as she transitioned home, and I made sure that I was at peace with food and my body prior to placement (since she was actually my motivation for healing). And then we decided we were done! We felt like we had exhausted our adoption resources (international adoptions are NOT cheap!) and there was no way I was ever going to go through infertility treatments again. We had used no form of birth control for over a decade so if I was going to get pregnant, it likely would have happened by now. Then one Saturday in June of 2017, I took a positive pregnancy test. I kept it a secret for 18 hours until I could tell Brady on Father’s Day. I about died with anticipation. I got up early Sunday morning to get ready for a church meeting and before I left, I woke Brady up to unwrap the positive pregnancy test. When he opened it he said, “Wait, let me put on my glasses…..what is this? To which I responded, “it’s a positive pregnancy test!” Then he said, “who’s is it?” Clearly, this was HUGE surprise for both of us. I loved being pregnant again. The day I gave birth to Andrew and they laid him on my chest, I wanted to live that moment over and over and over again. He was born on a Thursday evening so after we got moved to and settled in mother/baby, Brady went home to sleep with our other 3 kids and I stayed up all night just holding and staring at our new baby. I was exhausted, but I knew that I would always remember that first night of just the two of us and I wanted to soak it all in. I’ve thought a lot about why I’ve clung to Andrew’s birth story so much. Why do I have this aching feeling when I think of never having another baby? I’m not totally sure it’s because we are supposed to have more kids. The ache feels more like regret and anger. I’m angry at the eating disorder that robbed me of a decade of my life. I regret not being able to be FULLY present with my first two babies – like I’ve been able to with Andrew – because the back of my mind was always cluttered with perfectly planned meals and exercise rituals. I’ve realized that I don’t want to be done having kids because I’m finally experiencing the full joy of motherhood. If I’m being honest, it just feels so unfair. I see how much richer and more meaningful life is without food and body preoccupation. Maybe I’m wanting more kids to compensate for what I perceive as lost time. Obviously I have many great memories filled with love and meaning with all my kids. But I would give anything to go back and change the past. But at the same time I wouldn’t. Struggling with an eating disorder has changed me in ways that nothing else ever could. I know I am who I am today because of that experience. I also know that all 4 of my kids came to us at the perfect time and in the most perfect way. I’m so glad I didn’t get what I thought I wanted because what I have is so much better than anything I could have imagined. My regret is that they deserved a mom who wasn’t devoting so much mental and emotional energy to stay in an eating disorder. But I keep bringing myself back to RIGHT NOW. Acceptance means accepting all parts of me – where I’ve been, where I am and where I’m going. I’ve chosen to not fight food or my body anymore which allows me to prioritize relationships and connection. What’s most important is what’s right in front of me and my kids now get a mom who is healthy and present. I no longer have an eating disorder hijacking my values so I can be the mom I want to be NOW without dwelling on the past. Andrew is now a year and eventually I’ll fully wean him from breastfeeding. I keep putting it off because I’m scared to see what happens next. I lost my milk at 4 months with JC, which at the time I blamed on hormonal imbalance. In reality, I was exercising too much and not eating enough. But when I did stop, I had a normal menstrual cycle for a couple of months before it disappeared completely again. Weaning Andrew is going to bring one of two things: either I don’t menstruate (which has been my normal over the years) or I do. Both are terrifying. If I don’t, then there’s the issue of how to handle that. I’ll burn that bridge when I get to it, but it just brings up all the old stuff of feeling betrayed by my body. I’ll work through it though, just as I’ve done before. If I do menstruate, it means that another pregnancy could be a possibility and after 14 years of infertility, I may have to make the intentional decision to be done. I hate that. But I also know that the BEST thing I can do is let go and trust. 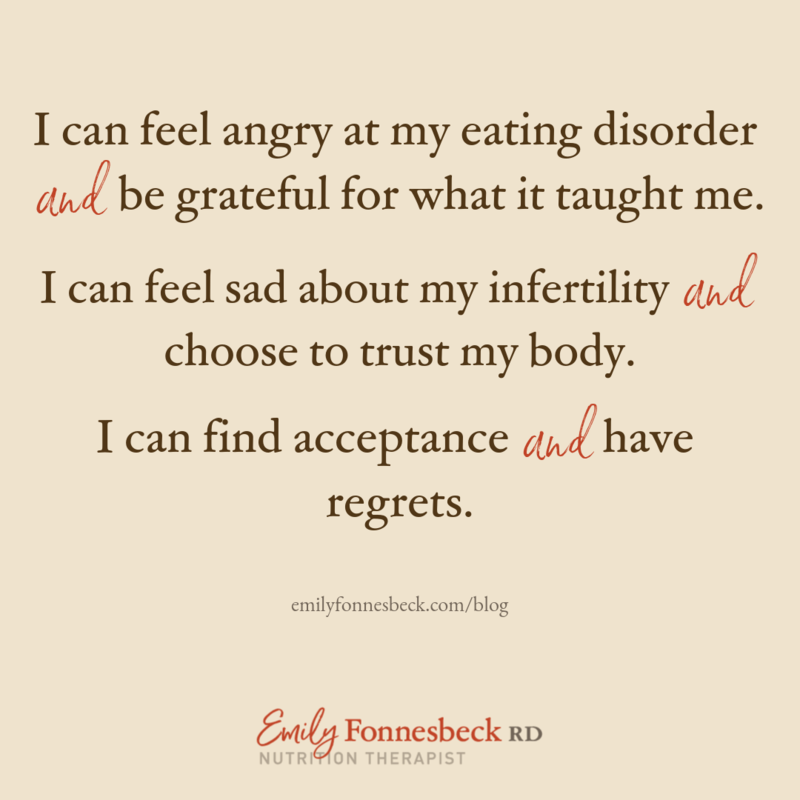 If I’ve learned anything from my struggles with food and infertility it’s that I don’t have control. What I do have is a choice and what I choose is to trust my body, trust myself and trust God. I believe that I’ve been given this body to learn unique lessons throughout my life. I am deeply grateful for what I’ve learned so far and I know that my lessons aren’t over. I believe that God has a plan for me. What’s ahead remains to be seen and I don’t need to write the ending before I live it. Anything is possible when we let go and trust. What gets to me though is that my struggle with food, feeling betrayed by my body or lack of trust isn’t unique. Women (and men) all over the world are losing years and years of their lives to food and weight preoccupation. We are being conditioned to believe that happiness is size specific, that our value is determined by our appearance (or the way our bodies function) and that fixating on food and weight is normal and healthy. Our cultural obsession with appearance is making us care about things that don’t really matter, choosing to sacrifice our values in pursuit of meaningless goals. Meanwhile, life is happening all around us. What are you sacrificing to stay in your dysfunctional relationship with food? Having tasted food freedom, there is nothing that could convince me to ever go back. Especially when I see all that I gave up for it. Once you see diet culture in it’s ENTIRETY and for what it REALLY is, there’s no unseeing it. And, I spent a lot of time feeling unloved by God or less worthy as a person because of my infertility struggles. Perhaps you’ve felt that your body is a lemon too. Because our culture places so much emphasis on bodies, we can start to feel less valuable if they don’t look, function or perform perfectly. I know I have felt that way. The reason for this blogpost is selfish; writing always helps me process how I feel. Infertility, adoption and eating disorder recovery are all wild rides and apparently there’s always another level of healing and acceptance. I’m also writing this as a cautionary tale: don’t make my mistakes. Don’t waste another day – another second! – on what you weigh or what you ate for lunch. You aren’t here to be pretty. Your value and potential goes FARRRR beyond what you ate for lunch. Why are we so easily deterred from that? And, finally, your worth and value is inherent. Your body ISN’T a lemon. It’s a gift and perfectly imperfect as you learn the lessons you are supposed to learn while living in it. I continue to practice trust and I hope you will too. I’m starting to see that “healing” and “being recovered” come with a lot of nuance. I can be sad about my struggles with infertility AND really grateful for them. I can regret my eating disorder AND recognize that I’m better and stronger because of it. I can wish my reproductive system was “normal” AND trust my body. I can be imperfect AND worthy and valuable. I can be angry AND brave. I can be scared AND trust God. I can have full acceptance for where I’m at and who I am AND wish things could have been different. JC will leave us in just a little over 4 years. The others will follow him all too soon. I will eat their birthday cakes. We will have Friday night pizza night every week. I will skip workouts to see their tennis matches and basketball games. I will listen to their stories and play games with them without counting calories in the back of my mind. And of course, in the middle of all that, I’ll also find time to take care of me but in ways that truly feel valuable and meaningful. I am very familiar with the feelings you are experiencing except I didn’t really feel like we were done with having kids but the craving for another child was gone after so many years. After our little miracle, we decided that we wouldn’t use any birth control and would leave it up to Heavenly Father if we were to have another baby. She’ll be 5 this year and no more babies for us since her.